The northern boundary of Middle America is rather vague, lying somewhere in the central Mexican state of Jalisco, where the Indians are largely acculturated to Mexican society. The area from Jalisco to the Panama Canal displays a bewildering network of native musical styles in mountain and jungle, hybrid and modern music, and rural and urban styles. 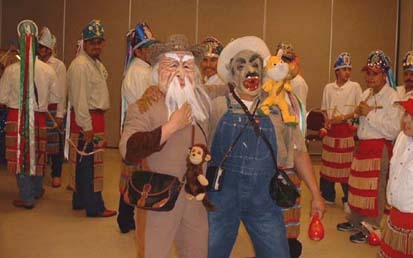 It would be convenient to assign the flute and drum music to native rites and the stringed music to Spanish fiestas, but there are exceptions. … stringed instruments appear in Carnival and Lenten festivals, … and in the fiddle accompaniments for the arrieros (“mule-drivers”) dance. … contiguous tribal groups manifest contrasting styles…. Though it would be a vast simplification, it is not impossible to set off the native musical styles retained in mountains, jungles, deserts, and generally in rural settlements as distinctly different from the music encountered at urban political fiestas and tourist attractions. The Fiesta of la Virgen de Guadalupe, on December 12, is the most important festival in Mexican tradition. In Independence, Oregon, people from Jalisco and Zacatecas who now live in Independence gather to perform the ancient ritual dances, with fiddle and guitar. Everyone in the community is welcome to participate/watch, and there is a delicious meal prepared as well. Hundreds of people attend. Around 1995 the local group lost their fiddle player, and I was recruited to help with the music. I learned from copies of tapes made on hand-held cassette recorders at dances in Mexico with much help from Pablo Orozco, rhythm guitar. [Pablo also plays excellent Nortenyo style accordion in other venues]. The two of us do all the string music, with ample rhythm from the rattles, bells and feet of the dancers. There are two rows of mostly men and a few young women dressed the same, and sometimes a few kids at the end of the line. There are usually 20 to 28 people in the dance, plus the clowns. In addition, a group of children ages 8-15 have been working out the dances on their own; a living tradition. For a few years a group of mainly teenagers were doing them in Corvallis, Pablo and I providing the music. The attire is Festival Indian: shiny headpieces trailing long ribbons, white shirts, a red apron with rows of decorations and bony tassels that rattle against each other; in the right hand a rattle and in the left hand a small bow. The bow is about 18″ long, strung with rubber tubing and with an arrow in place so that when the arrow is pulled back and released there is a clack! sound of wood on wood. Under the costume everyone wears a white shirt, blue jeans, and choice of shoes, often nice cowboy boots. Each dance has a tune, and the dancers refer to the tune either b y the name of the step or of a particular pattern of the dance; thus we have Portalitos for the little-windows dance, or La Son de los Pasos for one with an especially active step, etc. 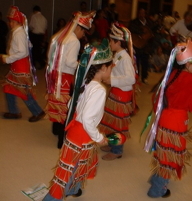 Each dance has foot-work or shuffles specific to the tune. Individual dances will last about 10-15 minutes; most are very active physically. In Portalitos, the windows, the main figure is something like a combination of duck-and-dive the length of the hall, and knit two perl one in weaving. Men in opposite lines hold on to their partner’s bow, making a pair: the head pair faces down the line, while the others face up: The 1st couple ducks under the second, but then backs up to go over the second while facing the same way, then re-ducks under them again, before going to the second pair, where they duck and dive and re-duck again; proceed to the third in the same manner; when they begin to duck under the fourth pair, the second pair follows them ducking and backing and re-ducking under the third pair, until everyone is ducking under or back-passing over, retreating over or under and repeating, to the far end; followed by a turn as a pair and repeat in the opposite direction until the head pair is back in place, and the knit-and-perl gradually subsides until the last two have backed through the next-to-last for the last time. And a few more figures…. I could not teach the figure at any of the square dances I call: too complicated! And while they dance through the patterns, one or two clowns dance in, out, through and around the lines of the dancers, both dancing with and mocking them. T he clowns have worn different outfits for most of the thirty-some performances I have been in on. Once one had a cowboy outfit and a Nixon mask, while the other wore a black robe, a large cross and a blonde wig and a mask (that happened only once). Once they had cap guns in holsters, with gunfights through the rows of dancers. One year, after a visit from a pushy news photographer the day before, they brought camera kits in waist bags and took photos of everyone, assuming whatever posture was necessary for a good angle including lying down in the middle of the dance and looking up. They had done hours of preparation also, cutting many portrait photos from magazines, pasting them on cards and storing them in the waist bags; they would take a fake photo of someone in the audience, then wave a 3×4″ card until it appeared dry, and give the phony photo to the subject. A “photo” of Pablo the guitarist showed a rock star with guitar, same color hair, same color shirt. Very handsome. Lately a monkey suit has been popular, also a large clown in wig and purple bathrobe, cradling a baby doll in his/her arm. A dance leader said the dances are ancient Aztec, but I think that is unlikely. The dances resemble something I’ve read about the Hopi and I think are basically traditional Native American from cultures Northwest of Mexico City. The tunes, I think, are partially derived from Medieval Spain, passed through centuries of native influence; and perhaps combined with native tradition. Some notes in the tunes definitely reflect the cries of exotic birds or coyotes. The title of one, Pico Perico, or Parrot Beak / Parrot Peak, has a very specific high sound of a birdcall in it. Most dances have specific steps – foot motion specific to the music. Los Arcos (The Bows) features at the end of each line of music, a triple clack-clack producing by snapping the wooden clackers on the bow-strings, with the motion of shooting an arrow. 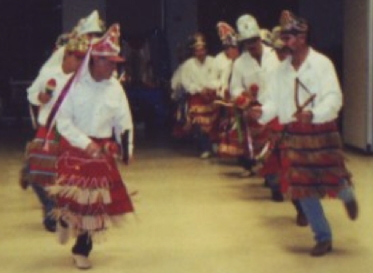 In La Columbiana, the pattern of the dance is done entirely on one foot until the end of the musical line (about 8 beats), when the dancer comes down on both feet then changes the active foot and repeats. La Cruz brings the dancers into crossed lines in the shape of a Cross, in many variations. Columpio has an unusual step; first man in the line links right knee around first man in the other line, bounces all the way around the other in a circle hopping on the other foot, then hopping back with left knees linked, and directly to the next in the line so that two pairs hop around each other, and on until everyone is involved in pairs, then winding through to the last ones in each line. No little kids tagging on this one – very energetic! El Adios, always the last offering, is a lovely dance. It is addressed specifically to The Virgin of Guadalupe. After some other figures, the men begin to remove their finery. The first pair dance up to the altar of the virgin and lay their headdress down; they then dance backwards to the second pair, do a little in-and-out figure there, always facing the Lady, and accompany the second pair up, who lay their headdresses down next to those of the first pair; repeated with each couple, and then all repeated again for the decorated aprons and at last for the bows and rattles; when the last couple have danced back to place, all kneel to the Lady and the series of dances is over. Some children are learning to continue the tradition. The total presentation by the adults usually lasts two or three hours. If you wish to be notified of the dance schedule for the coming season, email me at truprice@wvi.com sometime in Nov. or early Dec., and I’ll send you what I know of the schedule. Performances will almost certainly include Independence on Dec. 12; usually there are other performances as well, often Salem or Corvallis, and we have travelled as far as Forest Grove. Interesting event last night. Santa Nino de las Plateros. Outdoors on a small farm at the bottom end of Helmick Road, partly under some big maples. At the north end a small chapel of canvas, 3 sides with the south end open. On the north wall a painting of Our Lady of Atoche holding the miraculous child. In the 13th century the Moors took Atoche and imprisoned any men who did not convert. Only children under 12 could take them food. Some men had no children. The women prayed to the statue of the lady of Atocha, holding her child. A mysterious child of under 12 appeared and brought food to the hungry men. Later they noticed that the sandals of the child in the statue were dusty. In the 16th century people were building a town in Zacatecas Mexico when a mule came from the west, carrying a giant wooden packing crate. They took the crate off and the mule ran away. In the crate was silver body of Christ. So the city was named Plateros and they sent to Spain for an image of Our Lady of Atoche to be hung in the church with the silver Jesus. Soon silver was found in the neighborhood, there was a deep mine and an explosion. Many miners were trapped. Their wives prayed to the Lady of Atoche. A little child appeared to the trapped miners, bringing them water and showing them a way out of the mine. The child on the image now had dirty clothes. This repeated whenever there was trouble underground. Therefore 200+ people stayed up all night last night down at the end of Helmick Road. A small group of old people sat beneath the canvas and quietly sang hymns from one hand-written notebook, almost continually. In the open space 14 men in carnival Indian garb and sometimes 2 clowns danced while 200 people sat in the dark and watched and a few small kids tried to copy the dancers’ steps. We were soon beset by wonderful odors. After perhaps two hours we all ate. The mole’ was magnificent. Then more dances. Fifteen-minute versions of each, on that rough ground. After a few dances the dancers stopped to hold candles in two lines and frame a little procession for everyone with children – i.e., almost everyone – going into the canvas nave. This took nearly an hour. Someone brought a big coat for me, the only person not prepared, the only Anglo. It fit. Warm canela. Some of the small children crept into parents’ arms. But I had to bail out early, only a little after midnight – I hadn’t given the baby calves their evening bottles, for goodness sake! So we danced the Portalitos and at last a very detailed Los Adios, in which the men eventually remove their carnival gear, bit by bit, pair by pair, with figures between each bit. I commended the dancers for splendid dancing and was the first person to leave. I was sent off with a nice package of homemade tamales and breads for Suzi. Pablo and the others stayed all night until the morning. That was part one. We all enjoyed it so much that they decided to do it again Sept 29. Two more dances plus a third clown (the clowns all know the steps well). This time I left at one a.m. and I noticed some of the others packing up I think. Eight dances. One dance was 23 minutes, one was 20, others shorter. Suzi filmed most of it (murky, dark films, with the fiddle beyond the guitar). I stayed warm from playing, and they brought Suzi a blanket. Active footwork and vigorous body movement the whole time. And then, again in late October. It was colder, and they found a farm warehouse to move into. Filmed a lot of that too – but lost the best of the film. What an experience!